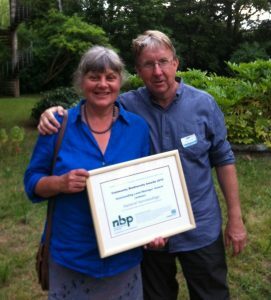 A massive congratulations to the team at Natural Surroundings who recently won a biodiversity award from the Norfolk Biodiversity Partnership. The award was for Outstanding Land-manager. Anne & Simon with their award and well deserved. Natural Surroundings is situated close to the River Glaven on the Bayfield estate. It has some beautiful grounds, in which native British plants and nature are celebrated and promoted. There is a newly created pond, a well managed wildflower meadow and wet woodland, with walks and a bird hide. There are art displays on site and visitors are introduced to several native species, including red squirrel, harvest mouse and freshwater eel in the form of a tank with elvers supplied by the Norfolk Rivers Trust. Visitors (including this cake-loving author) are also drawn in by an amazing cafe where they can look at live web cams focused on bird feeders and nests. Put simply Natural Surroundings is a great place to go with the family to see wild river valley wildlife and Simon & Anne Harrap and all who work at the cafe and in the grounds, have done a brilliant job and provide visitors with a chance to see the Glaven at its most lovely. I recommend the Norfolk rock cakes! Well done to Natural Surroundings! Previous PostThe Glaven eel project – the elvers are running!